Invasive species can be species of animals, plants, microorganisms, or pathogens that take over the habitat of other species, forcing the native species to decline in population or to disappear from their natural environment. They are highly competitive, highly adaptive, and successful at reproducing in many environments, including Alaska. Alaska is called "The Last Frontier" because of its vast natural areas including national and state parks, national forests, conservation areas, and its scenic and majestic rivers and streams... all of which attract a great deal of both residents and non-residents to explore these areas. These natural areas possess a great deal of beauty and biological diversity; both important sources of economic strength for our state. However, Alaska's resources are being threatened by invasive species. As travel and trade increase, the risk of new invasions also increases. Invasive species have a high price once they become established. How Do They Get To Alaska? Alaska is home to people who love the outdoors, travelling, hunting, fishing, berry-picking, and gardening. When we travel to our favorite spots, our means of transportation become pathways for invasive species. For example, ATVs can carry seeds from invasive plants in the mud on its tires. If the ATV is not properly cleaned before the next trip, it can drop these invasive seeds in a new, natural area that was previously free of invasive plants. People carry seeds on their clothing, on their shoes, and sometimes on their waders. Soils that have invasive plants can be dumped as fill in natural areas. Soil brought in with nursery stock may also have unwanted invasive seeds. Aquatic invasive species can get caught in plane rudders and boat motors. Report any invasive species you find. Educate yourself about Invasive Species in Alaska and in your specific area. 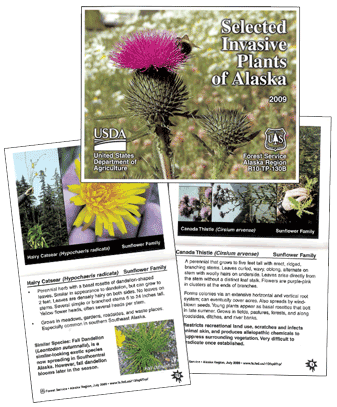 Request by email a USDA and US Forest Service Selected Invasive Plants of Alaska Pocket Guide (shown below) or the Alaska Plant Materials Center's Terrestrial Weed Identification Field Guide.  GET INVOLVED! Ask your local CWMA or Soil and Water Conservation District how you can volunteer!